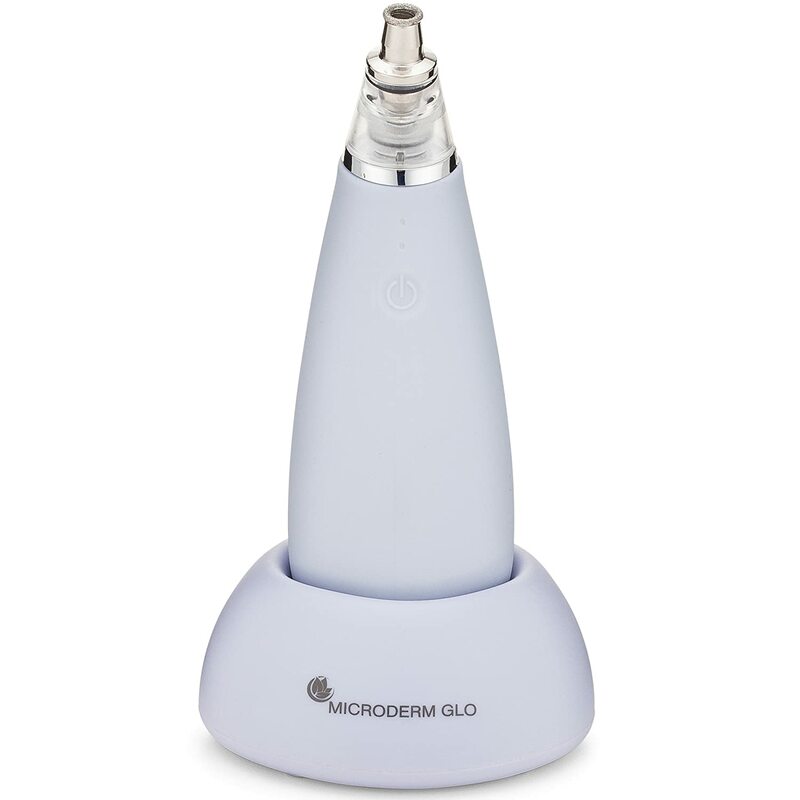 If you’re looking for a tiny microdermabrasion system, the Microderm GLO MINI is the smallest yet. This gives you the advantage of portability, so you can take it anywhere in the world with you. 4 easy steps… says the brand. That’s how easy and simple it is to use the GLO MINI. Wash, pat dry, use this machine, and apply your favorite after-microderm creams or solutions. But how did this diamond microdermabrasion machine fare among previous buyers? Is it a hit or a miss? Let’s find out in this Microderm GLO MINI review. Here’s what to expect from this beauty tool. – Tips. 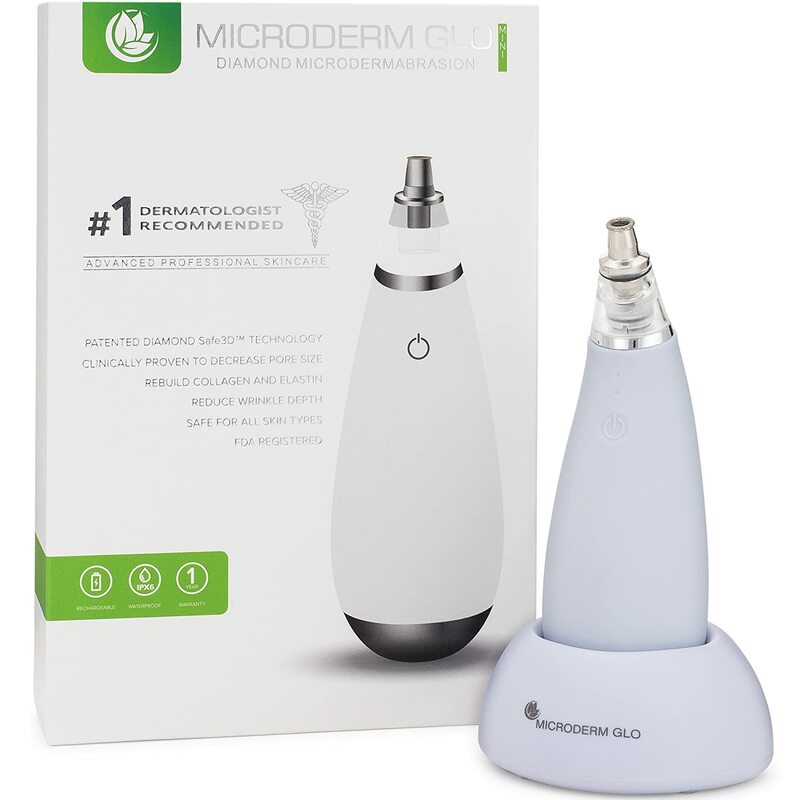 The Microderm GLO MINI is not just an exfoliating tool. It can also be a blackhead and comedo remover. Aside from the large and small diamond tips, also included are two suction tips. All you need to do is to switch these tips. – Speed. This unit comes with 2 settings – low and high. – Internal Indicator Timer. The GLO MINI beeps every 30 seconds, which is a useful signal to let you know when to move on to another area of your face. – Inclusions. Aside from different tips, expect the following when you unbox your package: charging cable, cleaning brush, carry pouch, filter replacement pack of 20 pieces, and user guide. – Waterproof. This device is given a waterproof rating of IPX6. Meaning, it can withstand powerful jets of water (12.5 mm nozzle). However, it should not be immersed in water. – Charging. You can either charge it via its charging base or with the USB cable attached directly to the unit. When the blue light appears, it means the unit is fully charged. Charging time is about 3 hours. What do previous buyers say about their unit? Here’s a summary of what we found out. – Performance. The Microderm GLO MINI can help in the overall quality of the skin, according to feedback. The diamond tips are not as abrasive compared with what’s used in the spas, but they get the job done, leaving you with minimal red marks on your face. Previous buyers have reported a variety of results from regular use of this personal microdermabrasion machine. One person says that her sun spots are now significantly lighter. The skin is also soft and clean. Not everyone is happy with the results, though. Some people said that this product has caused breakouts. Also, some were not impressed with the suction. For better results, you might want to get yourself a facial steamer and steam your face before using the GLO MINI. – Immediate Effects. You might experience redness and bruising especially if you hold the unit in one spot for too long. These should go away after a few days. – Design. The small footprint of this product is unquestionably a big plus. However, one flaw is the location of the button, which you can accidentally push or press during your microdermabrasion session. This is quite an inconvenience because the button is also what you use to adjust the speeds, and pressing it another time increases it to the higher setting. The Microderm GLO MINI is designed primarily to even out your skin as a result of gentle exfoliation. It’s also used to minimize pore size. Based on general feedback, this product delivers the results it promises to do. With regular and proper use, it can help improve the overall quality of your skin. However, it’s not a perfect machine. One flaw is the location of the power button. Since the unit is small, you may accidentally touch the button and unintentionally increase the speed.